Ben Franklin is known to have done "nature printing", which is the process of printing from a natural object such as a leaf. Some say he invented the process, but Wikipedia suggests that Joseph Breintnall was doing this several years earlier. Whoever perfected the process, Franklin definitely used it as an anti-counterfeiting measure. This "Collecting Colonial Currency" by Lou Jordon mentions that specifically, although his claim that 'paper money is uniquely American and was actually “invented” in colonial America' is inaccurate: the Chinese were doing that many centuries earlier. They were not doing nature printing, though! I was reminded of all this because of the recent discovery of an early leaf printing block. 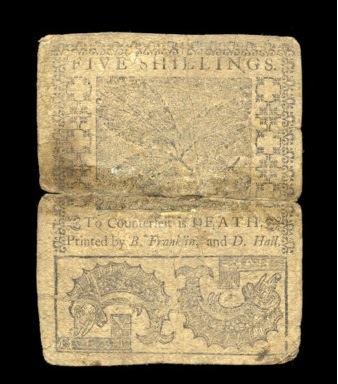 Although the title here says "Benjamin Franklin Printing Blocks Identified", the article itself admits that "this particular block was almost certainly cast not by Franklin but by his successor David Hall". Well, close enough, I guess. I know almost nothing about Colonial Currency, but I checked Heritage Auctions and found that many examples can be had at reasonable prices. For example, the note pictured above sold for $75.00 in 2000.